Preview: UTEP built their success in 2014 on a top flight run game mix with a defense that was able to capitalize on opportunities. The Miners have been built in the image of head coach Sean Kuglar who’s now led the program to a 9-16 record over his first two seasons as the head man. UTEP saw noticeable gains in 2014 going 7-6 overall, but the Miners came up well short in their bowl game losing to Utah State by a final of 6-21. With 12 returning starters the Miners hope to take another step forward in 2015. The Miners return key cogs in their running game, but if the team is to make strides on offense some sort of pass threat has to be developed. UTEP loses graduated QB Jameill Showers and it appears Mack Leftwich has the leg up on the competition to earn the starting job. Whoever wins the QB job will work behind a veteran O-line that returns 4 starters. The ground game will be the main feature of the offense again this year with star running back Aaron Jones back in the mix. The pass game will still be a work in progress as a completely new receiving corps looks to step in and have success. UTEP hasn’t been known for their defense over the past decade, but the Miners were able to build their success around defense in 2014. The Miners utilize the 4-2-5 scheme and the front looks to be a formidable strength with a number of returning starters back in the fray. The D-line brings back 3 starters and this unit will be built around Robertson-Harris, Bresolin, and Usher. The LB corps will return their two starters with depth having to earn their spots behind Jones and Musgrave. Even though the secondary returns just 1 starter there still proven depth ready to step up and fill the gaps coming into the year. 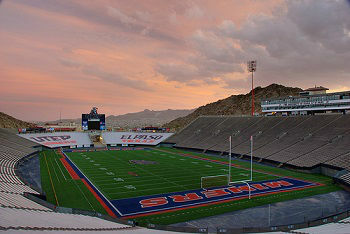 Prediction: The rebuild that’s taken place in UTEP has been impressive under head coach Sean Kugler. The team has successfully transformed into a power run offense complimenting an opportunistic defense that’s strong up front. The UTEP football program has suffered through a lot of losing over the past decade, but this group should be even better in 2015 coming off a winning season.